After making a quick exit from Syria, Safaa Tohme's family went from wealthy farmers to poor refugees. Now they're on the upswing again in Newfoundland. It was during a Ramadan family feast on their sprawling olive farm when Safaa Tohme and her loved ones had to make a quick decision. The group fled, leaving behind the farm and six family houses they had built up through time and hard work. Within five minutes of running from everything they owned, their house was destroyed. "We had a nice life before seven years ago," she told CBC's On The Go. After leaving their home, Tohme and her family left the country and headed for a refugee camp in Lebanon. That was their first taste of culture shock. "We are in Syria as rich people. We came to Lebanon and were down to zero," she said. Her husband would go to work for $20 a day, just enough money to feed their three children. They waited there for about a year, for a chance to leave and go somewhere safe. When Canada was presented as an opportunity, they jumped at it despite having no clue what they were signing up for. "We don't know anything. What is Canada? Where is it? Where do we go?" Tohme left behind every place she was comfortable with — her house, her country, her area of the world — and landed in Toronto three years ago. That's where she saw snow for the first time. They then boarded a flight for their final destination of St. John's. It's a date she'll never forget — three years and 20 days ago. "First we came here without any plans. Just to make a safer place. That's it. After that, I said we have to study, study and we have to make a plan." A study by Memorial University puts refugee retention rate in the province at 36 per cent. The Association of New Canadians says 485 Syrian refugees landed in the province, but it doesn't keep track of them beyond the first year of their arrival. While others are heading to bigger cities and more opportunities, Tohme said she's never thought about leaving. Tohme's youngest child was born in St. John's. Her oldest, who fled with Tohme and her husband, remembers the war. Her plan has changed several times — along with the birth of her daughter three months ago — but it has always included Newfoundland. She thought she'd become a nurse, and completed her language classes and enrolled in an adult basic education program to get her high school equivalency. 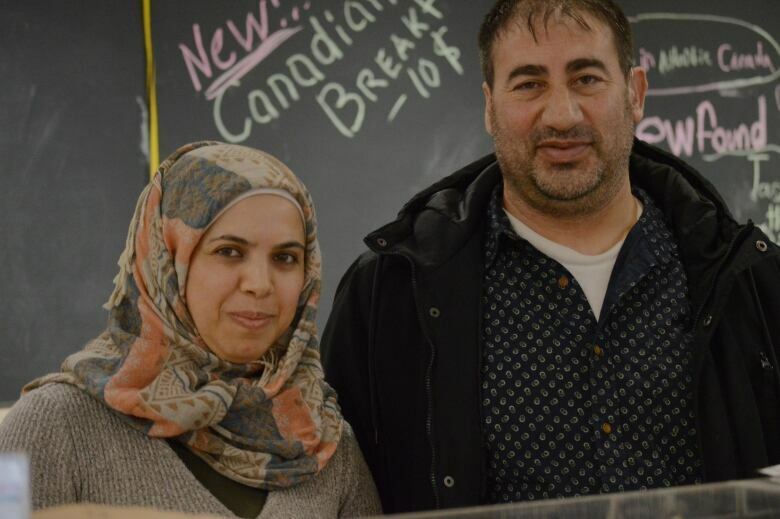 She began selling Syrian food at the local farmers market in St. John's and found an eager clientele. It went from being a side project to being a thriving business. "Now it's growing up and up. I think [now I will] grow my farmers market, my cooking. After that, maybe a restaurant." Tohme's husband and older children help her watch the newest addition to the family while she serves Syrian specialties at the weekly farmers' market. Her husband found work in a greenhouse and has been steadily employed ever since his arrival in St. John's. Part of what rooted the family in St. John's was an experience Tohme had at a Sobeys grocery store when she first arrived in the city. With three children in tow, she walked around the store getting essentials. When she got to the counter, a stranger leaned in to speak with her. "She said, 'You are a new refugee. I paid for you.'" The act of kindness reminded her of a place she'd lived before, where people took care of each other. It felt like home. "I love St. John's. I think St. John's is like my village, my Syrian village. I'm never thinking about leaving here. I am here. I will stay here." There have been awkward moments, too, like when her sons came home from school asking about boyfriends and girlfriends. She laughs while recounting the experience, explaining how they had never encountered the concept in their culture before. They are doing their best to live full and busy lives in their new home, but Tohme knows her children remember some of the difficult parts of their lives in Syria. "My older son, yeah, he remembers everything. He remembers when I lost my brother. I [lost] my brother in the war. The helicopters coming, lots of bombing — my oldest son, he remembers that." Rather than dwell on it, Tohme said, they are building new lives. Her oldest son wants to be a doctor, the other a police officer. They play soccer and basketball with their friends. For their family, St. John's has provided everything they needed for the last three years and 20 days, and many more to come. "My children's dream is here."